TexasGOPVote caught up with former Solicitor General of Texas Ted Cruz at CPAC 2011 to discuss his bid for the Republican nominee in the 2012 Texas Senatorial Race. In the video below, Ted Cruz discusses why he is running for Senate and why he feels he would make the best candidate. 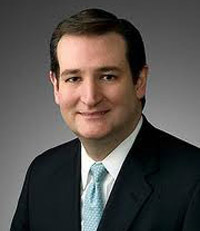 To learn more about Ted Cruz, visit his site: www.tedcruz.org. You can also follow Ted Cruz on Facebook and Twitter.